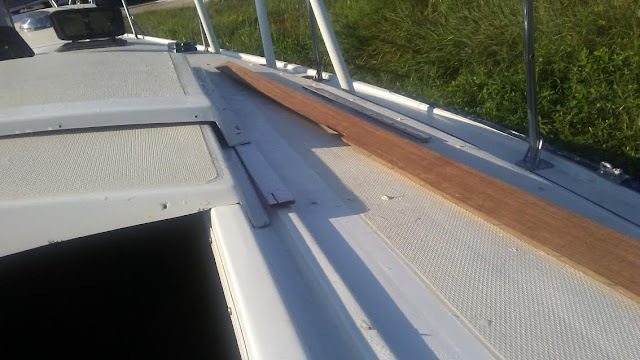 After replacing our rotten teak handrails with Plasteak, we needed to replace the rotten teak companionway trim and blocks. 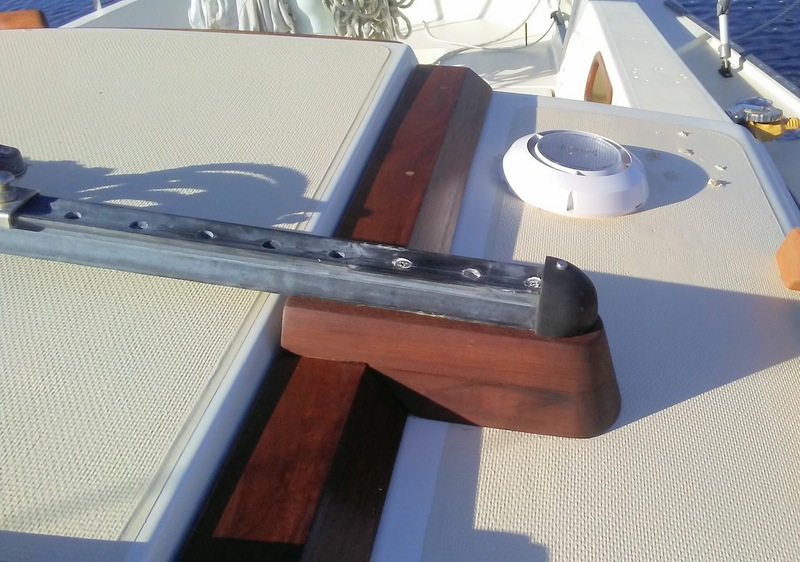 We didn't want to go plastic for the trim, but we also didn't want to go with teak. 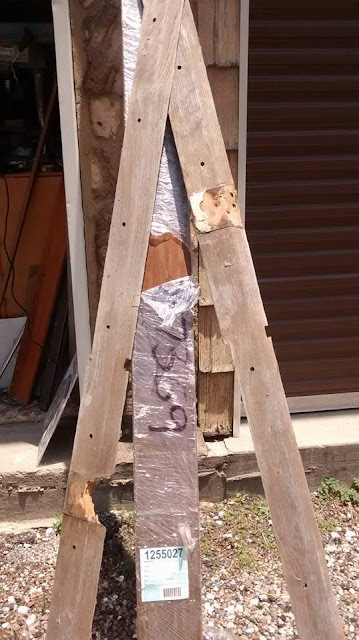 Instead, we chose Ipe wood. 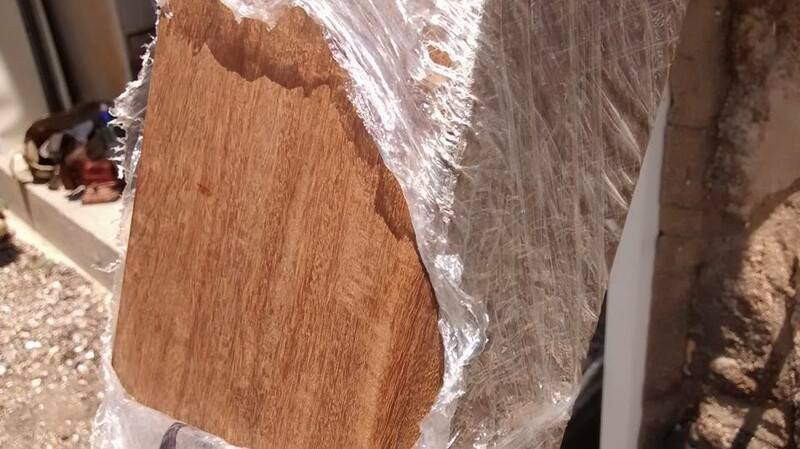 Like teak, Ipe is insect & decay resistant, but it's four times harder than teak (buy extra blades), and it's beautiful too! The picture above shows how it looks from the local hardware store. Luckily, a friend of ours is very familiar with Ipe and he did a fantastic job duplicating our companionway trim & blocks. 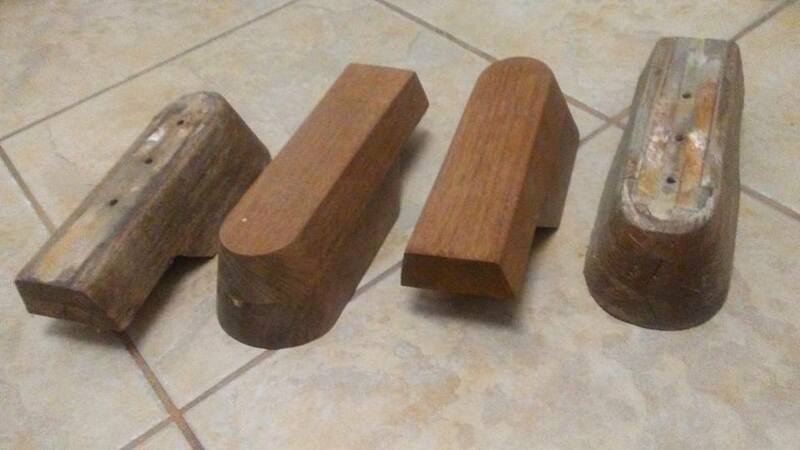 Below is a picture of the original teak blocks and the new Ipe blocks. Once all the adjustments had been made, the new Ipe trim and original teak pieces (companionway boards) were coated with Flood's CWF-UV. We love this stuff and have used it in the past, as it's easy to apply and only a couple of coats are needed. In fact, the rep that Ken spoke to on the phone stated that multiple coats are not recommended as this will cause the finish to mildew. 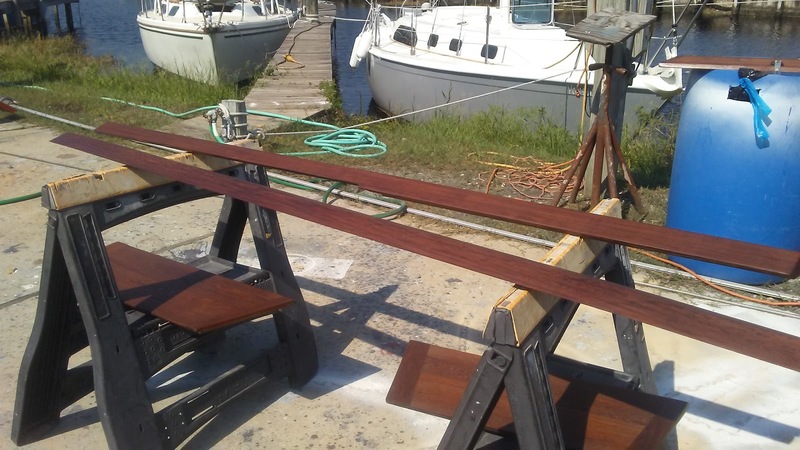 Since Ipe is such a hard wood, it tends to "spit out" some of the finish. We wiped off the excess and after about 6 months, we'll just add a couple of more coats! 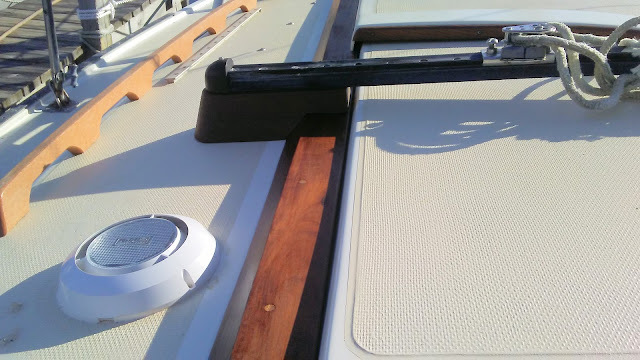 After adding slick tape to the companionway hatch to make it glide, we were ready to put the new Ipe trim on Nirvana and install the original traveler on the blocks. Note the new vent that we also installed ... replacing a broken one. The trim doesn't quite match our new Plasteak handrails, but we're happy knowing that we won't have to maintain the handrails. 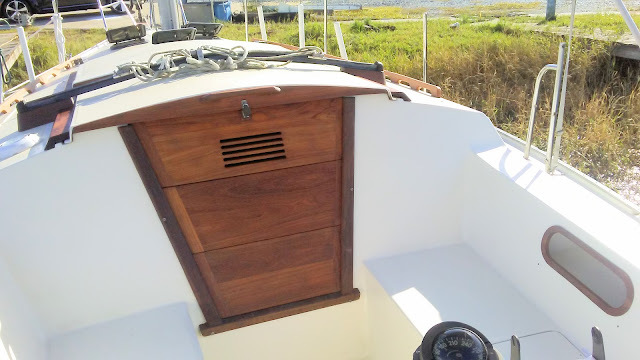 The companionway trim and boards are enough wood maintenance for us! Our recently (a year ago?!) painted deck finally has the trim back on., and Nirvana is coming back together! 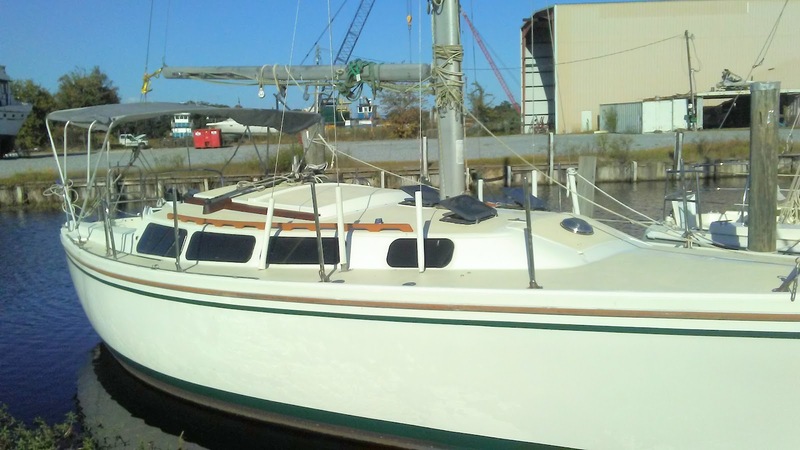 Our bimini frame is now on but we're saving our new bimini and using a plastic tarp for now. 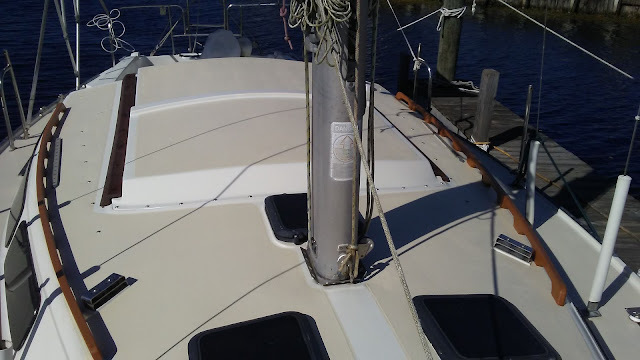 We're anxious to get the sails back on, but next ... replacing a couple of bulkheads and all of the plumbing! She looks beautiful! Love the Ipe! I'd never heard of Ipe wood before. Nice job - it looks great!